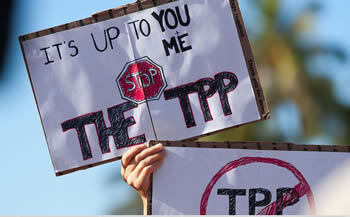 We are writing to urge the Congress to reject the Trans-Pacific Partnership (TPP). This agreement would destroy jobs, degrade the environment, undermine the Internet and weaken U.S. democracy and sovereignty. Your drop down menus did not open! 47713 2.6 years ago Robin Shelton Chesapeake, VA , US Do not support this agreement. For once, actually think about the people and not your own self interest. It's not about getting reelected. 47707 2.6 years ago Susan Brown La Mesa, CA , US TPP is the WORST thing you could do to our country and you should know that by now. READ IT? Please publicly commit to vote NO on TPP and related fake trade bills!!!! This action is sponsored by Popular Resistance, Flush the TPP, RootsAction.org, WarIsACrime.org, Organic Consumers Association, Alliance for Democracy, DailyKos, and The People’s Health Movement-USA. You may receive action alerts from one or more of these organizations. Also supporting this petition are: Fox Valley Citizens for Peace & Justice, Northern Illinois Jobs with Justice, Oregon Progressive Party, and Economic Justice Action Group of the First Unitarian Church (Portland OR).